Has the same great taste but with fewer calories. 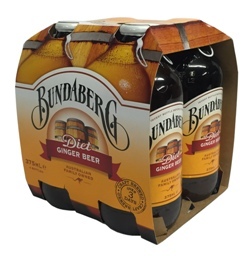 Bundaberg Diet Ginger Beer is naturally brewed for a better taste. Carbonated Water, Ginger Root, Sugar, Natural Flavourings, Yeast, Acid (Citric Acid, Malic Acid), Preservative (E202, E211), Sweeteners (E951, E950, E955), Antioxidant (Ascorbic Acid), Stabiliser (E412).